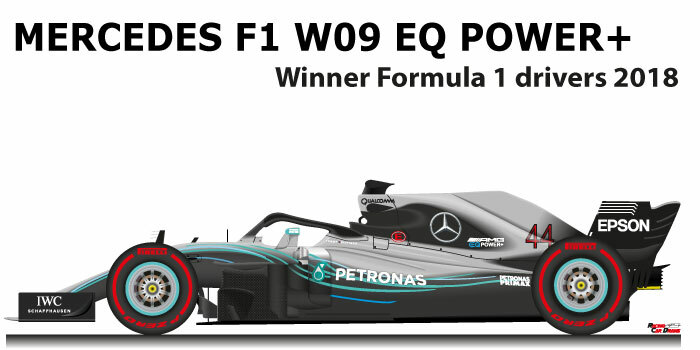 The Mercedes F1 W09 EQ Power+ n.44 is the winning car of the Formula One World Championship in 2018. Despite the victory of the world fourth in a row, the German team presented itself as the car to beat even in 2018. The new W09 was an update of the Mercedes F1 W08, the changes were mainly in the engine. The main opponent as in 2017 was the Ferrari SF71H. Lewis Hamilton driving the Mercedes F1 W09 EQ Power+ n.44 won the Formula 1 World Championship in 2018, for the British rider he was the fifth driver title. The season was marked by the challenge between Hamilton and Sebastian Vettel’s Ferrari. The German proved very fast in the initial part, leading the championship. But some errors by Vettel gave the English rider the chance to overtake the Ferrari driver and earn a margin of important points with which he could celebrate the conquest of the title at the Grand Prix of Mexico. Hamilton won eleven races during the season: Azerbaijan, Spain, France, Germany, Hungary, Italy, Singapore, Japan, Russian, Brasil and Abu Dhabi. Mercedes for the fifth consecutive year wins the constructors’ title. GP winner: GP of Azerbaigian 2018, GP of Spain 2018, GP of France 2018, GP of Germany 2018, GP of Hungary 2018, GP of Italy 2018, GP of Singapore 2018, GP of Japan 2018, GP of Russian 2018, GP of Brasil 2018, GP of Abu Dhabi 2018. Posted in DRAWS FORMULA 1.